Since 1975 they have been a regular visitor to the semifinals, creating a joint record too of entering maximum semifinals. Yet, to make an entry into the finals they had to wait till 2015 World Cup. They failed to break their semifinal jinx at Auckland in 1992 when Pakistan defeated them. But today, after 6 failed attempts, the maximum by any country, and 23 years it was a different day at Eden Park as New Zealand created a new World record of chase in World Cup Knock outs and emerged winner in the see-saw semifinal game against South Africans and extended their world cup lead to 5-2 against them. New Zealand becomes the 7th team to enter World Cup Final. South Africa loses semifinal for the 4th time. 299 scored in chase is the highest in any World Cup knockout match. 21 wicket makes Boult the highest Kiwi wicket taker in a single World Cup edition, and also the leading one for this World Cup. 25 runs in one over conceded to Brendum McCullum is the worst for Steyn in ODI. 4 50s by Brendum McCullum gets him joint highest in the number of 50s scored at World Cup 2015. With 531 runs scored Guptill needs just 12 more runs in final to become top scorer of tournament. 100+ Partnerships: 103 runs for 4th wicket by South African and for 5th wicket by Kiwis. New Zealand bowlers have been one of the best in this World Cup. They were no different today till 30th over. Replacement of Milne, Matt Henry was equally effective bowling two consecutive maidens to open his spell. Boult again got early breakthroughs. 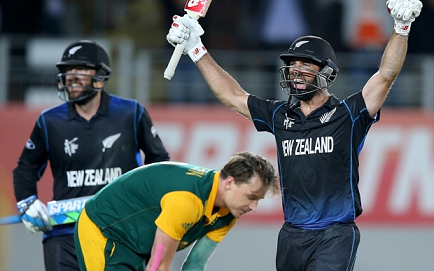 Southee, Vettori too continued to trouble. As a result after the quick loss of Amla (10) and de Kock (14) by 8th over, Faf du Plessis (82) and Rossouw (39) had no option but to struggle and consolidate. They could add only 83 runs in 18 overs. But, they created a platform on which AB de Villiers in the company of Faf added 103 runs and took the run rate above 5. They were 216/4 in 38 overs when rain arrived. It resulted in 7 overs reduction and they got just 5 more overs to play. Faf was the first to go on the second ball after resumption. David Miller (18-ball 49) missed his century but ensured South Africa add 65 runs in 5 overs. AB (45-ball 65) remained unbeaten with Duminy (8) as South Africa scored 281/5 in 43 overs. Southeee (0/55) and Henry (0/40 in 8) bowled 3 maidens but failed to grab any wicket. Boult (2/53 in 9) and Anderson (3/72 in 3) were the successful bowlers. Vettori (0/46 in 9) was bit expensive by his standards. Williamson and Elliott were also tried as Anderson was expensive. South African bowling had quality. Against quality bowling of Aussies, Kiwis had almost lost. But on the small Eden Park at home in Auckland, Brendum McCullum started firing from the first ball. He scored 26-ball 59 and by the time he was caught by Steyn on the bowling of Morkel in 7th over score already read 71. Williamson (6) was the second to go and with that the run rate started coming down. Guptill (34) was run out in 18th over and the man responsible for his wicket, Ross Taylor (30) was caught behind by de Kock on the bowling of Duminy in 22nd over. Kiwis were in trouble at 149/4 in 21.4 overs. Elliott (73-ball 84* runs) and and Corey Anderson (57-ball 58) had a clinical partnerships of 103 runs for 5th wicket and by the time Anderson was caught by Plessis on the bowling of Morkel in 38th over, they needed only 46 runs from 30 balls. But South African Imran Tahir and Morne Morkel kept the pressure on. As a result Ronchi (8) became Steyn’s victim in 41st over. In the last over they needed 12 runs with Elliott and Vettori (7) to face Steyn. Tough ask, but with a boundary by Vettori and a six as winning shot from Elliott, the Kiwis won by 4 wickets with a ball to spare. South African fielding saved them almost 50 runs today. But, it was the fielding that felt the pressure too. They missed multiple run outs, dropped some sitters too. Even in the last over, de Kock and Steyn could not use any of the two chances given by Elliott and Vettori for run outs. Steyn with an unusual figure of 1/76 in 8.5 overs was too expensive when South Africa needed him the most. Philander, who was preferred ahead of Abbott, was ineffective with 0/52 in 8 overs. Morne Morkel (3/59 in 9) was the most successful and with their most effective bowler Imran Tahir (0/40 in 9 with a maiden) brought back South Africa into the game. But, Duminy (1/43 in 5) and AB de Villiers (0/21 in 3) proved too expensive. With 5 of the 6 bowlers bleeding at a rate above 6.50 escaping a defeat was never going to be easy. And they were knocked out. The Black Caps have made their first entry to the World Cup final and will play the winner of second semifinal on Sunday, 29th March.